Oblates of Annunciation Monastery to Meet April 3 - All are Welcome! The Oblates of Annunciation Monastery will meet this Sunday, April 3 from 1-3 p.m. All are welcome! Oblates are women and men of varied faiths who associate with a monastery and live their lives according to the Rule of St. Benedict as their state in life permits. 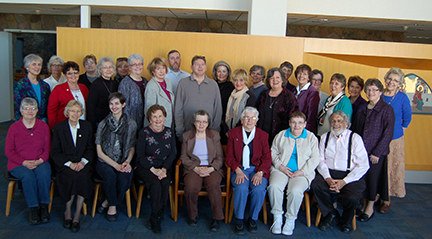 Oblates are supported through monthly meetings and interactions with the sisters, and the prayers of the sisters. Sunday's meeting will include ongoing study of Michael Casey's book, The Road to Eternal Life, and lectio (reflective meditation) on Jesus' loving message, "Peace be with you, "from the Sunday Gospel reading. As always, oblates are welcome to join the sisters for prayer at 11:00 a.m. at Annunciation Monastery and lunch in the monastery dining room prior to the meeting. If you would like more information about our oblate program, please contact Sister Patricia or Sister Rosemary at 701-255-1520. There is no charge to attend.